What image comes to mind when you think of air? Is it one with blue skies, a haze settling on the horizon, churning clouds, strong trees bending in the wind? Would your images of trees be more plentiful – majestic ones showing their age, large slash piles from clear cut sites, a specific tree first climbed as a child? Does the quality of air and the health of trees come to mind in those images? Seven artists have been engaged in KEEPING WATCH on AIR to visualize air quality issues and prompt a relationship with our ecosystem using our senses and our imaginations. The direct relationship between Charlotte’s valued tree canopy and our local air quality broadens the message. The artworks can bridge our understanding of how our air and tree canopy affect our physical, emotional, and economic health. Artist/scientist Andrea Polli developed Particle Falls, a 10-story tall outdoor projection combining art and technology, to make PM 2.5 air pollution visible. Less than 1/20th the width of a human hair, small particulate matter (known as PM 2.5 because it measures 2.5 microns or less) is invisible to the human eye. But when inhaled, PM 2.5, which is found in everyday sources like idling cars or diesel-powered truck exhaust, is linked to a long list of serious health problems, including asthma, heart and lung disease, cancer, adverse birth outcomes, and even premature death. Polli’s dramatic projection on UNC Charlotte’s Center City building animates real-time particulate data from a nephelometer to visualize particulate air pollution as bursts of red and orange colors on the image of a blue waterfall. Particle Falls has appeared in several locations across the US and abroad, most recently in Paris, concurrent with the UN Conference on Climate Change, and is made possible here in Charlotte with the strong support of KEEPING WATCH partner Clean Air Carolina. This outdoor community engagement project strives to increase public understanding of issues like PM 2.5 and in turn helps citizens make environmentally responsible decisions about travel, landscaping, and policy-making. Both Jed Berk’s Blubber Bots and Berndnaut Smilde’s Nimbus Dumont together in the gallery. Charlie Brouwer of Floyd County, Va., constructed a life-sized tree in the gallery. Robert Wiens’s large watercolors of tree segments. Inside UNC Charlotte Center City, in the Projective Eye Gallery, artist Jed Berk’s Blubber Bots enter the psychological realm as viewers encounter and interact with his blimp-shaped robots. They float and dance in reaction to light, air currents, and human activity, playfully prompting a personal relationship. With a few simple cues, curious viewers can interact with the Blubber Bots to explore how their actions change the Bots’ behavior. This engagement – however humorous or absurd – inspires questions about what is inside the Bots, whether we should be fearful and avoid them, or whether we should protect them. Berk’s Blubber Bots concept developed from a mixture of technical and aesthetic interests. While he did not originally set out to address air quality, he did want the Bots to “find an equilibrium with the conditions around them” or have the ability to be aware of their environment. This sensitive response can stimulate in viewers a similar awareness of other entities in our environment – perhaps even simulate our relationship with the air that surrounds us, the mystery of what is in the air, how we react to it and how we affect it. Berndnaut Smilde’s spectacular wall-sized photographic image of an indoor cloud appears unnatural, out of context, and perhaps alarming. But just as clouds outside point to changing weather conditions or human actions, inside they prompt questions about interior air quality and how we have affected it. Nimbus Dumont captures a fleeting moment when smoke, water vapor, air currents, and light converge into a visible cloud within a room. The architectural space chosen in Smilde’s “Nimbus” images somewhat defines the characteristics of the cloud created – some dense and threatening, others ethereal and spiritual. In the context of KEEPING WATCH on AIR, the ephemeral nature of the cloud represents the fragile nature of our air quality and the urgency felt when realizing how our designs and actions impact the air around us. 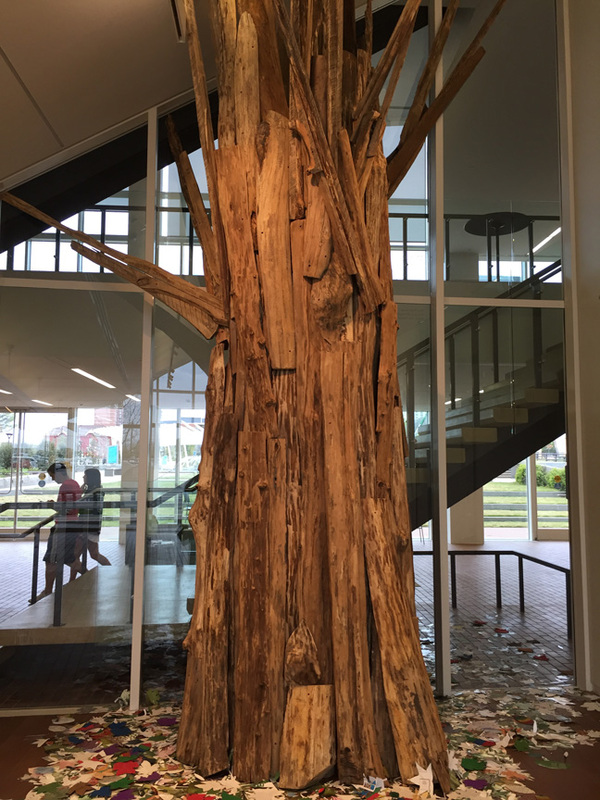 Charlie Brouwer’s life-size tree trunk, bulging out of the gallery atrium window onto the stairway, is made of slab wood, the rough, outer sections of a tree left over from milling lumber. Large sawmills usually chip the slab wood to sell for paper pulp. Brouwer’s choice of materials speaks of a reverence for wood both in its living and discarded states. It also prompts thoughts of the clear-cutting that results from our region’s explosive development, and the loss of the mature tree canopy so necessary to keeping our air clean. 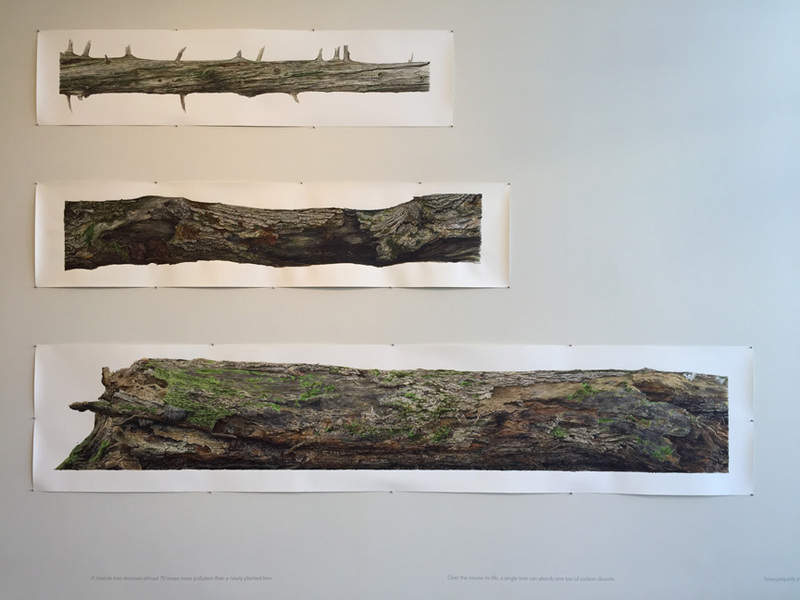 Brouwer constructs his trees with substantial girth, a memorial of sorts to the American forests of the 1800’s, with a realization that most all of the woods we now see have been logged multiple times. Remembering past forests and trees of his childhood inspired Brouwer’s title for this installation, Memory. Trees also remember and leave evidence of climate and catastrophe in the size of their rings. Surrounding the tree installation are 1,000 leaves handmade from recycled materials by students at First Ward Elementary and Shamrock Elementary Schools. Robert Wiens’s large watercolors of tree segments painstakingly document various species of trees found in old growth forests and also found in this region. Not unlike historical botanical illustrations, these watercolors bring attention to the individuality of each tree with their meticulous detail. Although the images look like photographs from a distance, Wiens’s gestural marks become free-form portraits of each tree when viewed closely. Painted from photographs taken of living, uncut trees, his compositions are cropped and painted as long, horizontal images to appear as though cut or deceased. Viewing a tree’s “corpse” suggests thoughts of forest conservation, clear-cutting, and the need to protect tree canopy in urban development. Presenting the works unframed and on paper further emphasizes their subjects’ vulnerability. Linda Foard Roberts’s image of a grand, mature tree touches on the emotional attachments many people have to trees in both memories and in everyday life. Spared is part of her “Grounded” series, a title prompting self-reflection as we all strive to feel connected and steadfast. The image’s size, details, and multiple layers depict the tree’s strength, weight, and scars of experience. Four panels, each a full frame image taken with a 5×7” camera, embrace the viewer and emphasize the tree’s spatial presence. Its almost cross-like composition reflects Roberts’s fascination with spirituality and mortality, the ribbon around the tree leaving one with hope that it will withstand adversity and the pitfalls of progress. Spared is a portrait of a special tree in Roberts’s life, and just as in her portraits of family members, transformation and emotional attachment are tenderly portrayed. Upright and healthy, this mature tree reminds us of how immense canopy trees outlive us and feed us with healthier air and shade as well as with economic and emotional wellbeing. The portrait personifies our personal relationships with trees just as Jed Berk’s Bots do with air. Curated by Crista Cammaroto, the front window case at UNC Charlotte Center City displays work by Kristin Rothrock, a lecturer in the Department of Art & Art History. Using scientific renderings of microscopic particulate air pollution, Rothrock has created brightly colored prints, probing the chemical makeup of air in a visually appealing form. Several works in the exhibition suggest the connections inherent in our ecosystem, addressed throughout the KEEPING WATCH initiative. Smilde’s work can serve as segue between air and KEEPING WATCH’s focus on water last year. 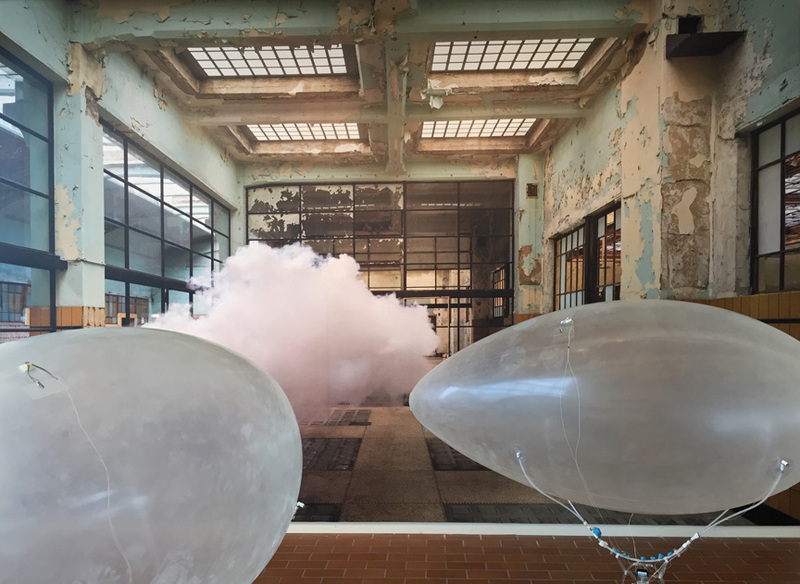 Vapor used in the making of his indoor cloud – like the vapor in heavenly clouds – carries many invisible particles and pollutants that can affect water, soil, and human health. The health of water and air are co-dependent. Similarly, Brouwer’s use of slab wood in his tree construction and the use of recycled magazines and newspapers for the leaves created by schoolchildren harken back to KEEPING WATCH’s focus on recycling in 2014. KEEPING WATCH on AIR challenges us to spend time with these works of art, with the air and trees contemplated and depicted here, and to recognize our enormous dependency on their availability and health. These artists help us recognize the value of healthy air and mature trees through our senses and emotions, with the hope of inspiring us to care – to care for all aspects of our ecosystem and guide our actions toward a sustainable future.